In this third Open Adoption Bloggers interview we meet Rebekah and Rebekah, the birth mom and adoptive mom with matching names of Tyrus, who was born in June of 2009. I wanted to interview them because they are semi-unusual in that both are active adoption bloggers who freely share their blogs with one another. The two Rebekahs write about their experiences as an adoptive parent and first parent, respectively, at Heart Cries and Sailing My Way Through. Why don’t we start by letting you introduce yourselves. (Rebekah @ Heart Cries) My name is also Rebekah. When I was a young teen I went to an early-day, Acquire the Fire youth rally that lit a fire in my belly to be a world-changer. At the time, my vision didn’t have any real teeth into it, I just knew I wanted to make a difference. I wanted to do something that went against the flow of traffic – something that would require me to be out of my mind for the sake of God (2 Cor. 5:13). It wasn’t until my husband, Ben, and I experienced the devastation of infertility that I realized God was handing me an opportunity to embrace humanity through his eyes, so that I could start changing the world one little life at a time. When we opened the door to adoption, we had no idea it would lead to an open-expression and new definition of family. I was under-prepared for how much my life would change by cultivating a relationship with my son’s mother. Rebekah has given depth to my vision and, to-date, stands as one of our loudest cheerleaders as we begin to head toward foster adoption. Ty’s adoption, truly, is an example of what God can do when all parties are willing to love His way. Blogging played a unique role in bringing the two of you together. Tell us about that. 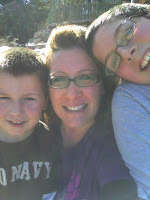 (Rebekah @ Sailing My Way Through) I started blogging when I became pregnant again with sweet Tyrus. I didn’t feel like I had any outlets. I was angry at the situation I was in and blogging gave me a place to explore that anger and find out what I wanted by just talking it through. When I finally decided on adoption I announced it on my blog. An old time blogger friend of mine suggested I look at Rebekah’s blog as they were looking to adopt. I did NOT think it would interest me but decided to jump over to Rebekah’s blog anyway. Surprisingly, the moment I set eyes on this beautiful couple… I knew I wanted them to be the parents of my baby. After nearly reading her entire blog it only confirmed that I HAD to meet them. It was the beginning of something wonderful!! (Rebekah @ Heart Cries) My only intention in starting Heart Cries was to pound out my emotions in an accountable way. I had never been good at keeping a journal, but I knew if people were reading, I wouldn’t be so quick to give-up. It was really important to me that our future children know how I ached for them. Never in my wildest dreams did I imagine that God would bring our child’s mother to my blog. I will never forget the first slew of exchanged emails from Rebekah. In part, I felt widely exposed and vulnerable, but then, quickly, realized that Rebekah had such a clear view of the genuine me…the side that an expectant mom, simply, reading our agency profile would never see. The fact that she read through many of my darkest days and still chose me to mother her son, reassured me that she not only knew my heart, but understood the kind of parents that Ben and I would be. You both read and comment at the other’s blog. Has that ongoing online connection influenced your offline relationship? (Rebekah @ Sailing My Way Through) It has most certainly influenced our relationship. We both lead very busy lives and our blogs are a wonderful tool for us to keep in touch. Yes, hundreds of other people are reading too so it’s not like its a personal message from Rebekah to me, but when I read her blog and look at the pictures of her wonderful family, it’s like reading a personal letter. Sometimes, I think she does write for me…nobody else might notice that…but I do and it makes me love her more. (Rebekah @ Heart Cries) Blogging, especially in those early days, helped us experience what the other mother was going through…in a way that emails and phone conversations never could. Both of our blogs are real reflections of what we’re celebrating and battling. Our blogging relationship helped thread together a bond of loyalty, faith, and trust. Although we’ve had some naysayers try to come between us, we always have been and always will be a united front. The friendship you see online is only a glimpse of what exists offline. Have you ever been surprised by something the other one wrote? Has knowing the other Rebekah is reading changed your own writing? (Rebekah @ Sailing My Way Through) Rebekah and I talk a lot more then we blog, so lots of times when we blog it’s about a conversation we had together and so there are no surprises. The uniqueness of our relationship is so cool that I rarely have to watch what I say. In the very beginning after Ty was born I was careful how much of my sadness I put on my blog. I didnt want to take away from her and Ben’s joy and I felt like if I poured my sorrow out on my blog (the blog she read) that it would squelch that for her and I didn’t want that. Now, I don’t have to worry so much. I blog openly and without worry. (Rebekah @ Heart Cries) No…we usually have the background to most things that are written publicly. If I’ve ever been surprised by something that Rebekah wrote it was in a good way. A lot of times I won’t know how much something means to her until I see her write about it. For example, we’ve recently started to Skype so that Rebekah and Tyrus can interact more regularly. It was so touching for me to watch them talk to each other through the computer, for the first time, but because the conversation was Ty-focused, I didn’t know how much it meant to her until I read her blog about it. I love that! It’s an extra dimension to friendship that I wish I could have in all my relationships. My post-adoption writing has changed because of Rebekah, but not because she’s reading. Because of the sister-bond that Rebekah and I share, there’s no way to separate the joy of Ty’s life from the pain it was birthed in. The reality of adoption hit pretty hard and ugly in the hours after we left the hospital. From phone sobbing conversations with Rebekah to holding a son that looked around the room for a mother that wasn’t me, this experience changed me…and my writing. What advice would you give to other folks wanting to write about their adoption experience online? (Rebekah @ Sailing My Way Through) Before I decided to give my baby up for adoption I didn’t really have many thoughts on the subject. In fact when I was given the option for adoption I pushed the idea aside. I thought that I would be a horrible mom and person if I even considered giving my baby “away.” I was so so wrong. After reading the blogs of several different women, both on the birth mom side and the adoptive mom side, I realized that it was a beautiful solution to my complex life. Blogging opened the doors for so much support for me. I am so thankful for my blog and the friends I have made because of it. (Rebekah @ Heart Cries) My best adoption advice is to set aside everything you think to be true and right and let God direct your steps. He, alone, holds the power to make all things new. When writing, it’s important to remember that our words are forever and not everyone will agree with them…and that’s okay! I make a habit of dismissing non-Truths, reflecting on part-Truths, and embracing God’s Truths. If you roll with that model, the world of blogging will connect you to the most extraordinary people and your life will be better for it. Thank you to both Rebekahs for taking the time to answer my questions! Be sure to check out the first two blogger interviews, if you haven’t already: Sara from Unofficial Mom and Racilous from Adoption in the City. WOW. THAT is amazing. Each situation out there is so unique but I think one thing remains true for everyone. Giving birth to a baby and placing him or her for adoption is unbearbly painful even when it's the right thing for the birthmom. Accepting the fullness of what it means to parent this child though adoption is also very painful and rewarding. It deepens everyone in profound ways. As always, you ladies are my heros. You live what how God intended for all of us to show His love to the world. You are both selfless, with your priorities in order. I love how you love each other. You two are AWESOME! I have loved reading both of their blogs since they were matched together! As always, their answers here reflect their genuineness and selflessness. Great interview!!! Wild to imagine that a blog (s) brought you both together. Powerful stories. So many layers. Thank you all for putting this story/ stories out in the world. You fail to mention how this adoption broke the heart of that baby's older sister who left soon after to live with other family. I don't know if she will ever get over this loss. That child did not need to be adopted, his mother is old enough to parent him. I do not see this adoption as a good thing. I am so sorry it happened and keep the natural mother in my thoughts. I have silently read both Rebekahs' blogs now for a long time, never commenting. But the previous comment has compelled me to speak out… Whether or not you agree with the situations which brought about, or resulted from, Ty's adoption, how can you be sorry that it happened? Being sorry that it happened is to be sorry for the (amazing) parents that Rebekah and Ben have become and to be sorry for the person who Ty himself is becoming. I find that totally unjustifiable. Heather, thank you for allowing us to share more of our story and perspective with this community. If adoption must happen, open is the way to go – and I'll cheerlead that until the end of time. No need to go into Web-Wars, here, but Kim's comment couldn't be further off-base. @Kim – It's true, the questions I sent to them didn't delve into Rebekah's reasons for placing her son or how his adoption affected the rest of her family. The interview was specifically about how blogging has influenced Rebekah and Rebekah's relationship. @Anonymous and @Kim and @future visitors to this post – I've never really moderated comments and I definitely don't expect every reader to agree with every post, with me, or each other. That said, I'm not sure that using this comment section to (a) debate the merits of a specific adoption or (b) tell other commenters that the feelings they've expressed are inappropriate is going to do any good. I'd like to respectfully ask that we not head down that road. I agree with Kim. Although Ty is in a very happy family it did break the heart of another child who is at such a fragile time in her life. I applaud both of the Rebekah's for their personal strength of character in this adoption process and the way in which they go forward in their relationship. Placing Ty's needs first above anyone else's needs of him was sacrificial on everyones part. That's what makes this relationship between the two Rebekah's so extraordinary. Thanks for sharing this! Kim, you made your point earlier. Thanks for this interview, Heather. I also want to thank you for the interviews in general. I am truly enjoying reading each one. My adoption-related blog reading has expanded as a result and this is a very good thing. Rebekahs: thank you for sharing your story. Thank you for opening up despite the negative commenters who will try to bring you down. I applaud your courage. I started reading Rebekah's blog while she was pregnant. She changed my way of thinking considering giving a baby up for adoption. I commend what Rebekah did. It had to be hard for her to give her baby to another couple yet She knew it was the best thing to do for her baby AND her family. I don't think she could have found a better couple than Rebekah & Ben to raise her baby. The relationship I have seen through them is heart-warming. I've followed both blogs for a long time now. I agree with Kim, the only people who benefited from this adoption are Rebekah and Ben. Little Ty would have been just as loved and cared for by his birth family. (Birth Mom)Rebekah's family would still be together, all her children spared the pain that this adoption caused. She decided on this adoption early on in a crisis pregnancy and once the other Rebekah was contacted, there was no turning back. She is a self professed “people pleaser” and would not have wanted to hurt the adoptive parents. Although I like both women and feel that they both have good intentions, this was an adoption that did not need to happen. Little Ty would have had a wonderful life with his mother and siblings. I am happy that adoptive Mom Rebekah is now looking into foster care adoptions where the children available really need loving families like hers. OK, My only point was that Birth Mom Rebekah is and was a great Mom and would have been to Ty as well. The fact that she doubted herself in matters of time and finances no doubt contributed to her decision to relinquish. With some support I believe she would have been quite successful with all five kids. She is indeed selfless when it comes to her children, and that is why I believe she could have done it. She has never been long between jobs and was able to successfully parent her other children. Ty lost as much as he gained by being adopted. Adoption is supposed to be for children whose parents cannot parent them. I do not believe this was the case here. As for Ty's sister, how can you minimize her loss? She will live with it forever. I lost a sibling and I still hurt over this every day. You may rationalize that they may have a relationship one day but the truth is that it may never happen. That baby does not know her, has seen her only once, and indeed will not even be brought up to refer to her as “sister”. Very sad! Rachel perhaps you should spend your time parenting your own children or living your own life instead of judging others. Melrose, you seem like such a nice person. No more posting from me. I think I made my points, I am not judging others just the situation. I already said I liked both women and felt they had good intentions. But Birthmom Rebekah and her kids DO have real issues because of this adoption that they will be working on for life. It does help tremendously I think that Adoptive Mom Rebekah is so committed to open adoption and that both Rebekahs have a genuine loving relationship with each other. I wish both families well on their respective journeys. Now, off to parent my children and live my own life. I'm a birthmom and I've been reading both blogs for a long time and here is my take on the situations. I feel as though Sailing my way through Rebekah made a hasty decision. She said in her blog somewhere that she wanted no reminder of Ty's birthdad in her life sadly I think that is how this whole idea came about. I really hope that Ty never learns of this because i believe he will have a really hard time with this. As a birthmom I think that at some point Rebekah may have had second thoughts but being a people pleaser she wanted Heart Cries Rebekah the “pretty, popular girl” who she wouldn't have been friends with in high school to like her and be her friend so she went through with it. Now Heart Cries Rebekah has no choice but to be her friend. Heart Cries Rebekah comes off to be as very self centered and selfish. I find it to be so odd how she is the one commenting on the other Rebekah's family dynamics as if she is the one living them. Rebekah lost two of her children due to placing Ty, she admitted that they were struggling with his placement and elected to go live with their father. How are we all wrong and off base? You got your baby and your perfect little family which in turn destroyed another and you can have your little open adoption fairytale til the end of time but the facts remain Rebekah. Just because an adoption is open doesn't mean there will be no pain and no scars and no trauma. Trust me, I will have emotional scars that will last me until my last days on earth and I too have an open adoption. This thread is going in circles and has sunk to sniping and potshots at certain points, so I'm going to go ahead and close it to further comments. Many thanks again to Rebekah and Rebekah for taking the time to do this interview.